The spring 2015 Course Guide has been published and Interior Design classes begin with ‘The Fundamentals of Interior Design’ class on Tuesday, February 10th. Classes are held from 6:30-8:30 p.m. I teach all of the Interior Design Certificate classes at the Fort Washington branch of Temple University but the program is offered at both the Temple University Fort Washington campus and the Temple University Center City campus. Hello, dear readers. I hope you are doing well this fine day! Today I wanted to mention, once again, the interior design classes I teach at Temple University. 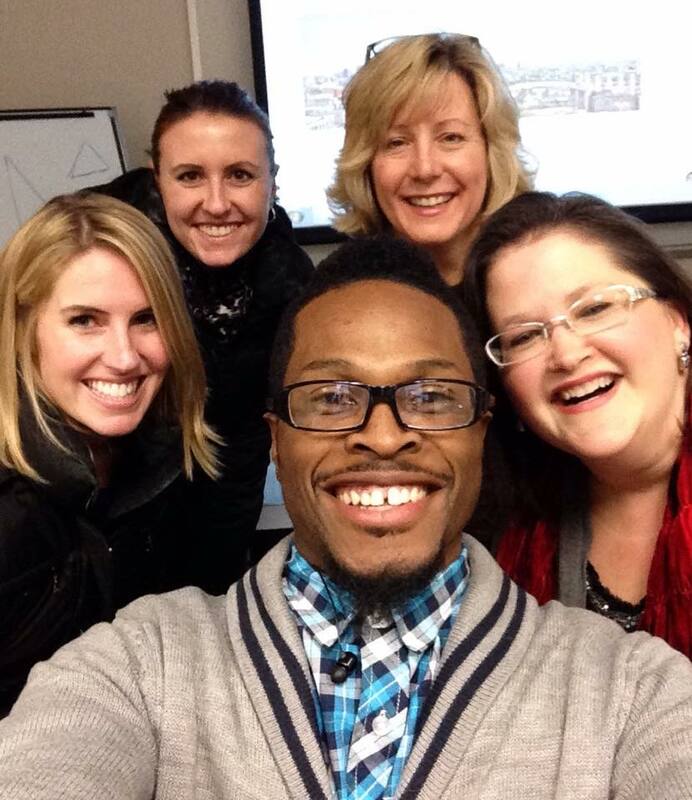 Here I am (at right), pictured with a few of my wonderful Interior Design students at Temple University. Can you tell we have a great time? The spring 2015 Course Guide has been published and Interior Design classes begin with ‘The Fundamentals of Interior Design’ class on Tuesday, February 10th. Classes are held from 6:30-8:30 p.m. I teach all of the Interior Design Certificate classes at the Fort Washington branch of Temple University but the program is offered at both the Temple University Fort Washington campus and the Temple University Center City campus. By all means, choose the course section that best meets your needs. A certificate of completion is offered to students who complete all 30 hours of course work, including the following five classes: Fundamentals of Interior Design, The Effective Use of Color, Fabrics & Materials, Furniture, and Lighting & Accessories. 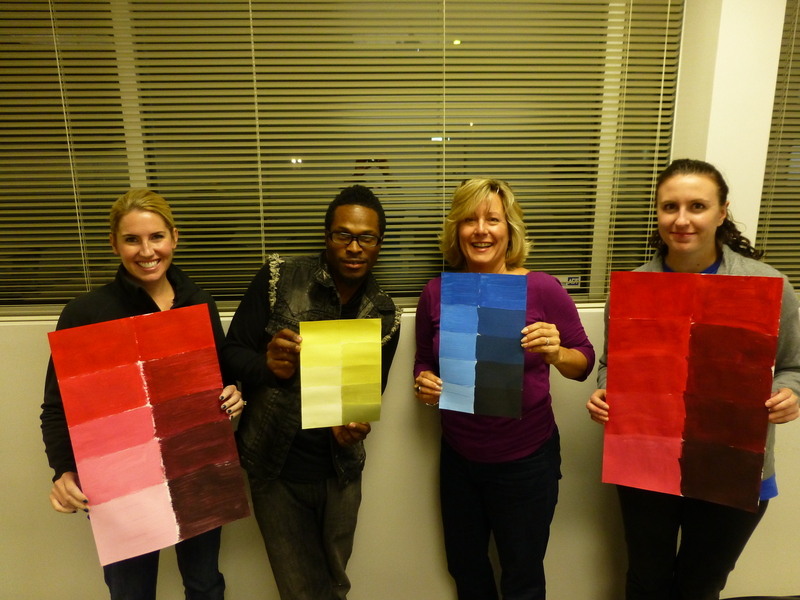 During ‘The Effective Use of Color’ class, we do some hands-on activities with mixing paint colors. It IS possible to complete the entire certificate program in one quarter, but there’s no need to rush–you can take the classes in any order over a two year span to qualify for the certificate. If you DO decide to take all five courses in the same semester and pay one fee, you qualify for an almost 15 percent discount off the total cost of enrolling in the courses sepa­rately. Although, no additional discounts apply. This entry was posted in Education, Interior Design & Decorating, Painting, Robinson Interiors, Temple University and tagged accessories, Certificate Program, Color, Decorator, Fabric, Fort Washington, Furniture, Interior Design, Interior Design Certificate, Interior Design Classes, lighting, Non-Credit. Bookmark the permalink.